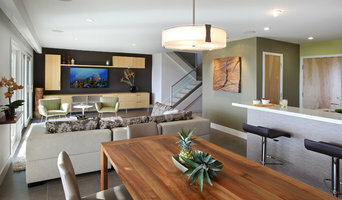 Orange County's Custom Residential Architectural Firm - Best of Houzz! My approach to design is based on the concept of "romantic modernism" where I reference and incorporate elements of the past while celebrating the simplicity and minimalism of modern design. materials such as stone, wood and steel are allowed to age in a natural and maintenance-free manner and then placed in the context of simple and clean modern space. With this dual approach my residences achieve a warmth and character of traditional design combined with the excitement of modern design. I am personally involved with every aspect of the home. once I have finished the plans, my job has just begun. over the course of construction I involve myself with every aspect of the design. during this time I am able to address the thousands of big and small questions that arise, ensuring the execution of the design and the success of the project. Eric Aust Architect brings 22 years of architectural experience in all aspects of design. Specializing in custom residential design and commercial development, I provide my clients with individual attention to all aspects of their project needs. I work closely with my clients to design spaces specifically for their needs and appropriate for their site. Having started my own practice 15 years ago, I provide a cohesive architectural process from initial concept through to the finished, built structure. I have an expertise in residential design in Newport Beach and can help navigate the often tricky city design guidelines. Eric Aust Architect has the ability to take your architectural dreams from initial ideas to reality! Exceptional Design. Exceptional Service. Exceptional Value. These are the cornerstones of our work. Along with a mastery of great architecture's fundamentals: Space, Proportion, Light, and Material, we craft meaningful spaces for the intimate moments of your life. Let us create something great for you. Honored with multiple design awards, and recognized for consistently outstanding service, Anders Lasater Architects has designed homes from coastal Orange County to Palm Springs and the mountain resorts of California, from Texas to the Big Island of Hawaii - always finding a unique resolution in each location, tailored to its place, its time, and its users. Are you looking to do a remodel, or addition? Or maybe planning on building a new house? We can help, here at David Michael Designs ( <a rel="nofollow" target="_blank" href="https://www.dmdesignsoc.com/">https://www.dmdesignsoc.com/</a>) , that's what we do. From the simple to the complex, residential & commercial, we offer all kinds of drafting services, & it is a lot easier then you might think. David Michael Designs has been around since 2003, designing almost every kind of structure. We have been fortunate enough to draw for the most outrageous over the top jobs, to the most basic common of structures. But where we excel the most, is with you the client. If you're looking to improve your home, look no further than here. From the basic kitchen & bath designs to room additions, house add-ons, 2nd-floor additions, churches, apartments, residential homes, basic landscaping, pool houses, California rooms, indoor-outdoor designs, you name it, we love to design it. With the power of 3D, we can make your project come alive, offering you a clear look into your project. We like to take the guesswork out of the contractor's bid. If everyone knows and sees what you want before it's built, that gives everyone the opportunity to get what they want right from the start. It's all about ease, we love to make it easy. Oatman Architects, Inc. is located in Newport Beach, California. We are an architectural design and planning firm specializing in luxury custom homes and boutique hospitality projects around the world. We design homes that feel like resorts and hotels that feel like home. Southern California based Stratos Form architecture emerges from the life and style of the people who inhabit it, the needs of the site and our amazing climate. Stratos Form is in the business to understand our clients needs, explore the potential of their projects, and provide accurate thoughtfully crafted solutions. As a husband and wife team, with a diverse portfolio of design styles, we believe architecture should respond to people - not the other way around. We are motivated by the belief that our role is to facilitate an intelligent and thoughtful process of discovery that explores untapped potential, and delivers a custom home that inspires you. Stratos Form is in the business to understand our clients needs, explore the potential of their projects, and provide accurate thoughtfully crafted solutions. d'Arcy & Associates Architecture, Inc. Founded in 2012, d'Arcy & Associates is an Award-Winning, full service Architecture firm led by President and Founder, Charles E. d'Arcy III, AIA NCARB. Centered in Irvine, CA. d'Arcy & Associates prides itself on its ability to develop creative solutions with a sensitivity to the client’s schedule and budget. Proper management is key, but it is the firm's passion for each project that draws the client's attention and makes the design process an innovative one. Through a collaborative and exciting journey, the firm brings the client's vision into a realized state. At the core, the firm believes it is our duty to design and develop high-performing, high quality buildings, which not only impact the client, but the larger community as a whole. Orange County Premier Architecture Firm | Best of Houzz! McRae Lambert Dunn is a full service Interior Design firm known for its innovative, approachable environments that are a stylish reflection of their clients’ discerning tastes and lifestyles. Their objective is focused on providing clear and concise solutions that improve and capitalize on the fullest potential of a space. Their goal is to create timeless stunning living environments that are a reflection of their clients’ personalities, while enhancing their quality of life. Every venture is a true strategic collaboration, taking in full consideration the clients discerning wishes, needs, and budget. Their distinguished designs result in repeat long-term relationships with their satisfied clientele. With our background experience stemming from corporate and retail work, we typically take a more architectural and practical approach to the design of an interior space. Whenever possible, we prefer to be involved in a project from the initial stages, working closely with the Architect and Builders in defining a space functionally as well as visually. We are committed to creating a “visually seamless” result throughout a project. Our “hands-on” approach to design and installation assures quality and excellence in all phases of the project, and to the needs of our clients. Working as a team on every project, we believe that our clients benefit from our combined experience as well as service. Regardless of a projects size and scope of work, each job receives both Partners attention. Here at JF Carlson Architects Inc. our goal is to provide our clients with a high level of Architectural design services at an affordable cost. Jim Carlson the principal of JF Carlson Architects has over 40 years of commercial design and construction experience and he has been a licensed architect in California for over 30 years. He handles the design, coordination and entitlement aspects of the project himself and all of his consultants and independent contractors. As a result, your project always receives his vast experienced and personalized attention. How do I find the best Newport Beach, CA architect for my home design or renovation project? When building or renovating your home, you don't simply hire an architect or building designer — you build a relationship with them. Be sure you chose a home architect who will be involved in all phases of the design process, from the initial concept to the completed construction. Architecture is an incredibly technical profession and one where getting things wrong can literally put lives at risk, so ensure you hire a professional with a valid license or an architectural firm to maintain high quality and standards. Your next consideration will be architectural style. Some residential architects specialise in designing traditional homes or farmhouses, others in designing modern replicas of traditional homes. While a few have a knack for imagining bolder, more futuristic architectural design in Newport Beach, CA that incorporates the latest technology. How much does hiring an architect in Newport Beach, CA cost? Home construction and renovation often have a preset budget and hence it is important to understand how much architects charge. While there is no set payment structure, independent architects may charge differently from architectural firms. Architects sometimes choose to calculate their fees on the basis of a per square foot rate. In rare cases, especially with smaller projects, Newport Beach, CA architects may choose to ask their clients for a fixed fee. Make sure the total figure and payment schedule is agreed as part of your contract, particularly if you are trying to accurately estimate the cost of building a house. 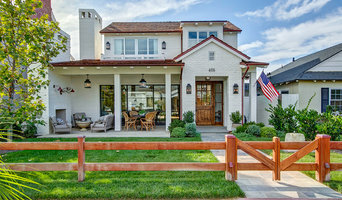 Find a home architect in Newport Beach, CA on Houzz. Narrow your search in the Find Pros section of the website to Newport Beach, CA architects. You may also look through photos projects to find building designers in Newport Beach, CA who have worked on a project similar to yours.